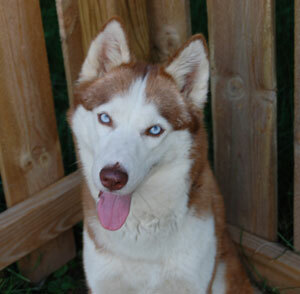 Reba is a ten-month-old darling with a red and white coat and gentle blue eyes that has quickly warmed herself into our hearts. She was found as a stray, though we can’t imagine losing such a wonderful girl. Reba has a lot of puppy energy and loves to play with the other pups – this girl can run! She is very affectionate with people and enjoys quality time with her humans after a good play session. Reba gives great husky hugs and kisses! Reba is settling into her foster home. She is housebroken and trustworthy for her age. She will need another canine companion or someone very active to channel her puppy energy, as well as someone that will dedicate time and patience in her further training. And yes, like her namesake she has a beautiful voice!